I recently attended a wedding where the bride and groom had an actual tree stump as the centerpiece on the gift table. The story was that they cut the tree down themselves and carved their initials in the trunk. It was quaint and rustic, and admittedly a little bit different. 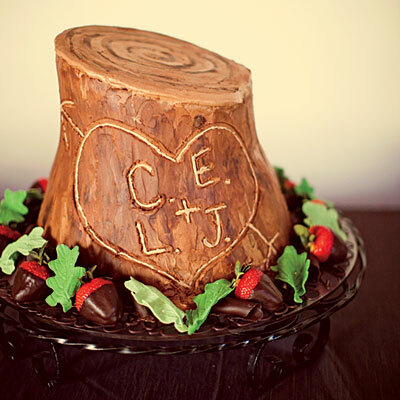 And, it didn’t look as nice as this tree trunk groom’s cake. I have to say this is a brilliant idea for a groom’s cake – it’s masculine, and outdoorsy, and hopefully made with chocolate cake! I love the idea of having a groom’s cake that looks different from the wedding cake (which we all know is really all about the bride), but still fits in with the theme of the wedding. This tree trunk cake, complete with the couple’s initials, would look great at an outdoor wedding or even a fall-theme wedding. And it’s the perfect cake if your groom is an outdoors kind of guy! How could he not love this cake?